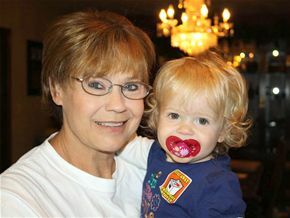 Last month my mother, Sherry Bozarth, retired from 18 years in the Oklahoma public school system. She took a position in the school cafeteria when I was in junior high so that she would have the same schedule as my sister and I – and, I suspect, so that she could keep an eye on us. After several years, she became a para-professional, a position she held for 13 years. Para-professionals support special educational needs students in the classroom. Over the years she worked with a broad range of students with very different needs. And during that time, as I watched her grow within her career, I learned a lot about what it takes to offer education to all students. I have worked with students with special educational needs as a teacher, a teacher’s assistant, and as a volunteer. I realize that providing these students with real, meaningful educational opportunities takes a great deal of time, effort, and patience. My mother worked year after year, taking part in professional development to keep abreast of new technologies and new pedagogical ideas, reading textbooks at home at night to make sure she had an individualized plan for her students, and standing up for the students she supported inside the classroom and within the school. She sometimes came home from work with bruises after a child had kicked or hit her in a difficult moment; several times I watched her cry when one of her students was ill or in trouble; and many times I heard stories about students spitting on her, yelling at her, or threatening her. But she never lost her dedication to those students and their right to an education. She took one of her students on a field trip to a renaissance fair in a city 60 miles away, because that was his dream. Every year she looked forward to the Special Olympics like no other person I know. In fact, sometimes after listening to her brag about the medals her students won my sister and I wondered if we needed to explain to her how the Special Olympics really work. All Special Olympic participants receive a medal and the top three receive gold, silver, and bronze medals; my mother never included the color of the medals in her success stories. Each day she called me on her way home from work. Some days she was tired, but her passion for her education and her pride in the daily accomplishments of her students was always there. It was my mother’s dream to work in the public school as an educator, so it is hardly surprising that she did so with such zeal and dedication. And that zeal is obvious when you run into one of her students. My mother worked in a school in a rural town of 1,000 people – the same school I attended from K-12 – so it is unavoidable that you run into her students everywhere you go. Just yesterday she told me that one of her students saw her getting out of her car and yelled her name until she came to say hello. She worked with one girl for several years and if you happen to see her in town she runs over and shares everything she has done since the last time she saw my mother. These students see what I see in her and so many educators in our schools—a true love of teaching and a pride in student achievement. My mother’s dedication to equal educational opportunities for all students is something I see in our schools a lot, but it is not something we hear about in the news lately. Our teachers, principles and superintendents are key to strong school systems, and the support staff play an equal role. Strong support from a school’s para-professionals often makes the difference between a child with special educational needs receiving meaningful educational opportunities and a child moving through the system without the opportunity to grow. So thank you Mom for all your hard work. I am proud of you. And thank you to all the dedicated para-professionals in our schools.